Ms. Passy Mubalama is a pro-democracy and women’s rights activist with over 7 years of experience in promoting democracy, human rights, good governance and the rule of law in the Democratic Republic of the Congo (DRC). She is founder and executive director of Action and Development Initiative for the Protection of Women and Children (AIDPROFEN), a nonprofit organization that promotes women’s rights in the eastern region of the DRC. Her personal experiences reporting human rights violations from Goma’s IDP camps inspired her in 2011 to found AIDPROFEN. In 2016, with funding from NED, she founded the Education Center on Democracy and Human Rights in the DRC, which organizes trainings and arranges meetings between community and local party leaders in order to bolster women’s political engagement. For her notable work to strengthen women’s and youth participation in public affairs, she received a Mandela Washington Fellowship from the Young African Leaders Initiative in 2014. 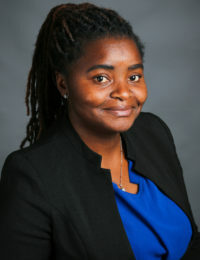 During her fellowship, Ms. Mubalama worked on a handbook of strategies to address conflict between women’s political participation and traditional notions of the role of women in eastern DRC.